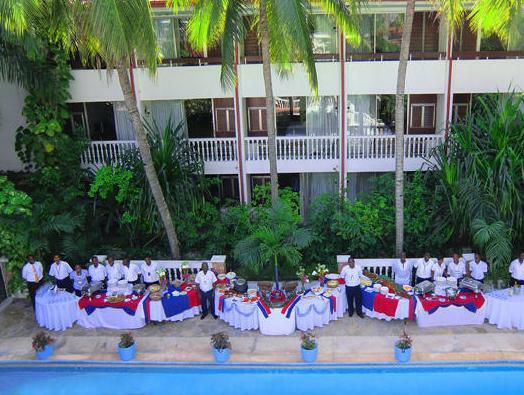 ﻿ Best Price on Le Plaza Hotel in Port Au Prince + Reviews! Le Plaza Hotel in the capital city of Port Au Prince features an outdoor pool, free Wi-Fi and complimentary parking. It is only 2297 feet from the National Palace. The air-conditioned rooms at this modern hotel feature a flat-screen TV with cable channels, a telephone and a desk. They also come with a private bathroom with free toiletries and a refrigerator. This hotel also offers meeting spaces, laundry service and a fitness center. The hotel features an on-site restaurant with room service, and there are several bars and restaurants within 0.6 mi of the property. Le Plaza Hotel is only 394 feet from the French Embassy, and Haiti’s Chamber of Commerce is 1.2 mi away. Toussaint Louverture International Airport is a 15-minute drive from the property. Payment for your entire stay will be required at Check-In. Guests are required to show a photo ID and credit card upon check-in. Please note that all Special Requests are subject to availability and additional charges may apply.